In this Clinical and Professional Skills Lab (CPSL) showcase, we take a look at the design and development process of one of the first CPSL learning modules to be created, “Basic Information and Usage of PPE.” We hope that this showcase would give you an idea of what a CPSL learning module is all about, what the process is like, and how Teaching and Learning can help. In our Places to Start with Great Impact series (Part 1, Part 2), we offered some simple ideas for enhancing your students’ early experiences in your course. Even though July is almost over, it is certainly not too late to implement some of the ideas below – contact us today if you are interested! Build as much of your course (materials) as possible now (in the master): Summer is a great time to build! Master shells are great for getting your course prepared for your students between semesters – you can start your projects (with us!) and/or revisions as we’ve got the shells prepared for a new semester, and you don’t have to worry about accidentally publishing something! As a bonus, Teaching and Learning does a final quality check of the master shells before we publish them to students in the semester shells. If you’d like instructor access to a master shell as a team member, please let your team leads know. Course intro video: A short course introduction video can be an invaluable tool that serves multiple purposes: 1) it’s a great opportunity for you to talk briefly about your course, its purpose, why it is important, its structure, and so on; 2) it puts a face to your name; and 3) it can be your students’ first opportunity to get to know who you are as a professional, as an instructor, and/or even an individual from a personal perspective. Creating an intro video is simple with MediaSite; OTL would also be glad to help you with it! All masters for AU18 core and elective courses are ready for your edits! As a reminder, masters shells are used for getting your courses ready between offerings; currently, OTL refreshes the masters before each offering so they have the latest template, as well as content from the most recent offering of your courses for you to work from. Do let us know as soon as possible if you would like to use Carmen for your graduate courses as well! The summer is a great time to work on projects (with us)! We’ve offered some low-effort but potentially high-impact project ideas in Part 1 of this series … and we have even more for you in Part 2! The post-offering team report is a good opportunity for you and your team to reflect upon how your course went: what worked, what didn’t quite work, how did the students respond, what can be even better yet, and so on. Are your course goals and objectives still accurate? One way to approach this question may be to consider how well they support the latest industry expectations of day one veterinarians? Some courses, especially those earlier in the sequence, may provide such support indirectly by targeting foundational knowledge, skills, and so on. Sometimes, your students may need a little bit of help seeing the relevance of your course or your class session – this may be a good place to start tackling this need. How well do your contact hour outcomes support your courses goals and objectives? Adequate alignment of contact hours is essential for achieving the overall goals and objectives of your course, and often helps with the (sometimes difficult) decision of what should be specifically targeted, and what should be supplemental. Here are some tips for writing learning outcomes. How well do your assessments evaluate your students’ achievement on your stated learning outcomes? The content and format of your assessments should be aligned with your outcomes. 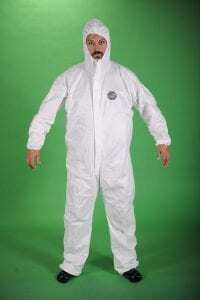 For example, a multiple-choice question on what is considered Personal Protective Equipment (PPE) may not be appropriate for “explain the importance of Personal Protective Equipment (PPE)”, but would certainly be for “list common PPEs in veterinary practice.” Here’s our collection of resources on developing assessments. As you review your student evaluations as part of the team report project, you may come across additional themes or ideas that you may want to explore or discuss further. Feel free to reach out to OTL for a conversation! Rubrics that are well-constructed make it clear to all of your students what your assignments and/or assessments expect of them, and can make grading exponentially easier for you. For example, we have worked with instructors on constructing analytic rubrics for writing assignments, and the Spring 2018 Objective Structured Clinical Examinations (OSCEs) were graded on rubrics as well. We have a section on our website regarding rubrics in terms of transparency, reliability, and efficiency, including a recent blog post. The summer is also a great opportunity for you and your team to review/revise your test questions in Carmen and/or ExamSoft. Testing is most appropriate for foundational knowledge and lower-order thinking skills, but it is not impossible for a well-written question to target something more advanced, such as application. We recently hosted a faculty development session on writing test questions and item analysis, and we are currently brainstorming recommendations regarding the process of writing test questions, which we will share in a future update. Continuing the theme of alignment, the learning materials and activities in your course should support your students’ achievement on the assessments and, in turn, your learning outcomes. This is not to suggest “teaching to the test itself” – rather, the alignment helps to ensure that students are provided the information as well as experiences that they need. Carmen and Top Hat are great tools to implement your out-of-class experiences. Options in Carmen include modules, assignments, quizzes, and discussions; options in Top Hat include file uploads, interactive pages, questions, and discussions that can either be assigned for review or for homework. During a class session, Top Hat is a great tool for quick knowledge checks and discussions. In addition, the Center for Teaching and Learning at Yale University provides a list of active learning strategies that you can implement to further engage your students in thinking and doing. As we work with our Clinical and Professional Skills Lab (CSPL) partners to design and develop the learning units, we have also been brainstorming activity ideas that takes advantage of the new space. In the meantime, the Wenger Lab is an existing space that is optimized for active learning, equipped with movable furniture and computers/screen for group work. Lastly, the portability and versatility of the iPads presents opportunities for learning activities in terms of interactive / multimedia content, digital creation, as well as collaboration. We’d love to talk with you if you have ideas! While the summer break has just begun for (most of) our students, Teaching and Learning already has its sight set on the upcoming Autumn 2018 courses – in fact, we have just finished refreshing the Autumn core courses, and they are now ready for your edits, design/redesign work, and so on! We will do the same with electives in the next week or so. With the students gone, the summer is not only a great time to slow down and recharge (as much as you are able to, that is), but also for projects (with us)! In fact, there are a couple projects that we think are relatively low-effort, but would have potentially large impact on your students learning experiences! This is the first set of recommendations that we have – stay tuned for more in the following weeks. While a mere document, the syllabus is your students’ first look into the ins-and-outs of your course – who teach it, what are they expected to know and be able to do (i.e. outcomes), how would their learning be assessed (read: how are they graded), what are the academic integrity expectations (i.e. the honor code and assessment types), how can they get help (i.e. office hours), and so on. For this reason, the syllabus should be informative and accurate, while concise enough that it’s not an exercise in comprehension skills. The Curriculum Management System (CMT) provides a great outline as well as templates for what should go in your syllabus. Ever find yourself devoting most of your first class session reading through the syllabus verbatim? Answering students’ questions about the course when the answers are readily available on the syllabus? Well, you may need a syllabus quiz! The Office of Distance Education and eLearning recommends a required syllabus quiz at the beginning of the course, with the release of other course content contingent upon receiving a passing score on the quiz. For just a little bit more “incentive”, you can attach a point value to your syllabus quiz. While you may continue to find it beneficial to engage in syllabus Q&A during your first class session, the syllabus quiz should help with filtering out the basic questions you might be asked otherwise. Contact Teaching and Learning if you are interested! 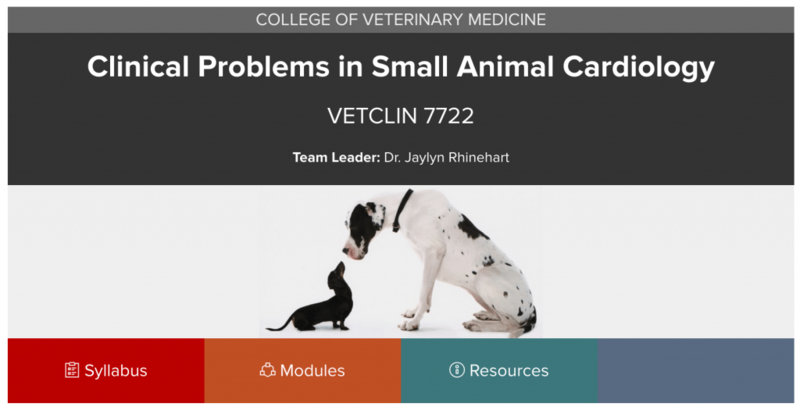 One step further: All DVM courses come with a “Course Q&A” discussion board that you can take advantage of – students may already have satisfactory answers to each others’ questions, and you can intervene / elaborate when and where needed. Many instructors have also used the Announcements functionality to share answers to individual students’ questions with the entire class. A short course introduction video can be an invaluable tool that serves multiple purposes: 1) it’s a great opportunity for you to talk briefly about your course, its purpose, why it is important, its structure, and so on; 2) it puts a face to your name; and 3) it can be your students’ first opportunity to get to know who you are as a professional, as an instructor, and/or even an individual from a personal perspective. This social presence can be especially in an online course, where “face time” with instructors can be limited if not non-existent. 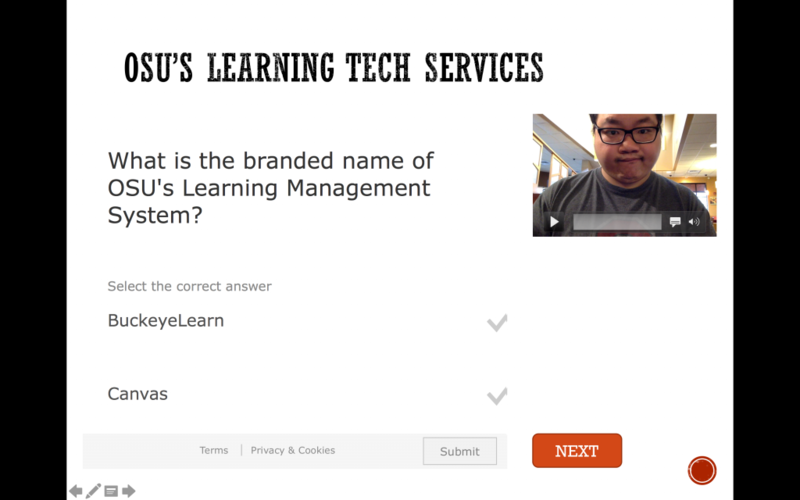 Below is an example from the Online Master of Learning Technologies program – if you are interested, contact Teaching and Learning! One step further: We have updated the Carmen template to include a course banner area – this provides even more opportunity for you to customize your course landing page! Below are some examples. If you are a power user of Top Hat, you may have realized that it is more than an engaging in-class student response tool in that it is also a flexible, on-demand tool for organizing your class sessions. For example, Teaching and Learning has worked with some instructors to upload their PowerPoint slides to Top Hat, where they can insert activities strategically at certain points during the class (for example, for start-of-class and end-of-class knowledge checks/reviews) and present the entire set without having to leave Top Hat. Top Hat also now supports interactive slides that contain hyperlinks, animations, and embedded videos from YouTube or Vimeo. The quality learning that takes place in Top Hat does not have to stop when your class session ends. While the “Present” mode makes your Top Hat content available to students in a live setting, the “Homework” and “Review” assign modes allow students to access them outside of the class. Review: This mode releases content to students on a non-graded basis. When you assign a question to students for review, they will be able to respond to it and see the correct answer, but you will not have a way to tell who has completed it and how they did. This mode is great for displaying items such as learning materials, practice questions, and activities that have already taken place in class. Homework: This mode releases content to students on a graded basis. When you assign a question to students for homework, their responses will be automatically graded and recorded in the gradebook. This mode is great for items like out-of-class activities that are not available in Carmen; for example, “Click on Target” and “Word Answers” (for word cloud purposes) or activities that you intended to get to during class but didn’t quite make it. As always, for all things Top Hat, please feel free to consult with Teaching and Learning. Having remote attendees during lectures makes it especially important for instructors to incorporate engaging, interactive activities. These activities allow you to check if your remote participants are attending and actively listening. In fact, these are some of the same concerns that active learning strategies aim to address during face-to-face class meetings. If you hold in-person class sessions and expect students to attend, you may want to offer them experiences not available by watching lecture captures. In particular, one of the active learning tools Teaching and Learning supports is Top Hat. By default, when you present a Top Hat question in class, all students who are enrolled in the Top Hat course can see and respond to it, regardless of their physical location. If it is important to you that students are participating in your Top Hat questions from approved locations only, please schedule a time to brainstorm with us. Did you know that Top Hat also supports activities that can be completed outside of the classroom? For example, you can assign to your students slides that you have uploaded to Top Hat and questions you have asked during a class session for review purposes. You can also assign content that students complete out-of-class as homework. If you do assign graded content in Top Hat, please work with Teaching and Learning to transfer the scores back to Carmen. Competency-based education in human medicine moves away from the idea that competence is related to time on a rotation. The fundamental premise is the Day 1 test. On Day 1, what can students do with no supervision? What are the abilities needed of grads? How can we sequence from novice to expert? How can we enhance teacher-trainee interaction? What learning activities are really needed? How can we use best practices in assessment? Did you know after 8 minutes of lecture, college students begin to fade out? If they are intensely focused, that increases to about 20 minutes. 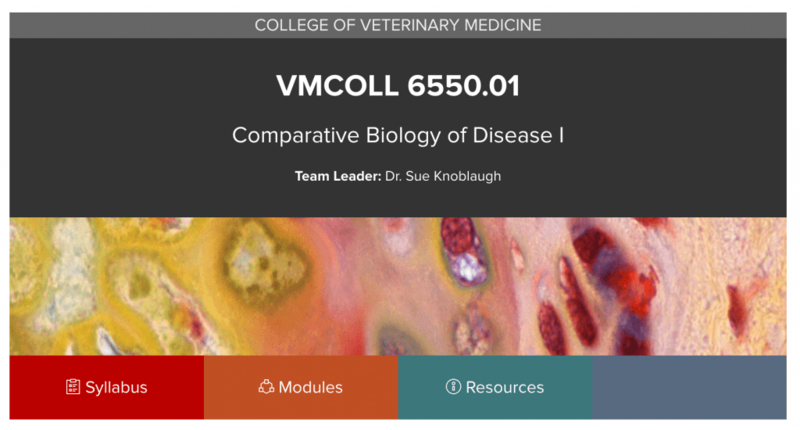 Due to clinical skills lab construction, some lectures that currently take place in the VMC have been moved to the Goss auditorium. Goss’s smaller size has necessitated live streaming core lectures to the AT Lab overflow location, and VIS has worked to implement a solution with the Zoom conference tool. While Zoom is not currently among OSU’s officially-supported online conferencing tools, both VIS and OTL have found it to be a great alternative that can be easy to set up and use. If you have used CarmenConnect before, you will be familiar with Zoom online conferencing features, including audio and video, text chat, screen share, breakout rooms, as well as ongoing and scheduled meeting rooms. In particular, breakout rooms are a great way to implement group work and discussions in a online, asynchronous setting, where students are expected to connect individually. Cleared by OCIO Cybersecurity for data element classifications up to S2 (Internal). Supports session recordings directly stored in the cloud with a sharable link. No time limit for meetings with 2+ participants. No technical or arbitrary limit to the number of concurrent attendees allowed that we are aware of. While Zoom is currently a temporary solution to the CVM classroom situation, you may find online conferencing tools appropriate for other synchronous education experiences, such as bringing outside expertise into your classrooms. For example, Professional Development 3-B invites an outside expert to speak about animal law via Zoom. If you ever run into a situation where you cannot be physically present in class, or if you are interested in other educational applications of online conferencing tools, please feel free to contact cvmotl@osu.edu for some ideas! For general business-related conferencing needs, please consult vishelp@osu.edu. 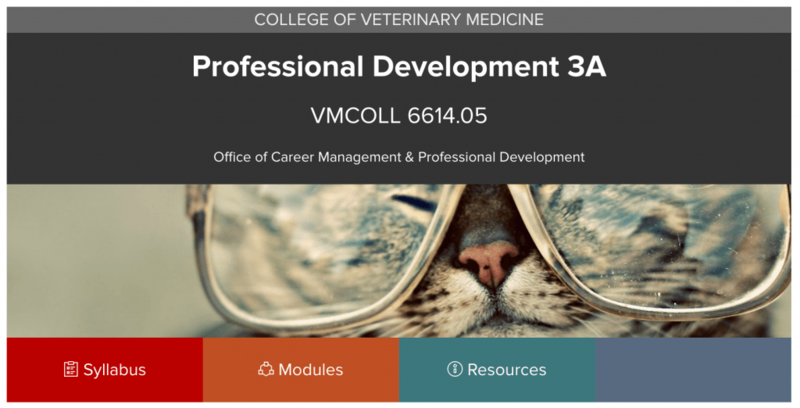 A new Competency-Based Veterinary Education (CBVE) framework unveiled Saturday at the 2018 conference of the Association of American Veterinary Medical Colleges (AAVMC) represents three years of intensive work and lays the framework for schools to develop a competency-based curriculum. It is probably the most significant work of the organization to date and facilitates the shift from faculty-centered teaching to student-centered learning, said Chief Executive Officer Andy Maccabe. “We don’t consider this product to be a perfect, final product,” he added. Instead, it will be updated and revised as educators implement it, and all schools are invited to adapt the framework. The EPAs are accompanied by descriptions of activities, relevant domains, and elements within the activity. AAVMC conference attendees from our college look forward to sharing more information upon their return. In this installment, we would like to show you how to turn your existing PowerPoint presentations into standalone learning modules.